In which our story comes full circle, and everything you know is wrong. So it turns out the world of Utena is built on layers and layers of lies, right down to that opening fairy tale we’ve been hearing since the first episode. Surprise! There’s not much in the way of spoiler-free episodic Utena analyses out there, and this episode highlights one of the major reasons for that. It’s a series that I do think can be enjoyed the first time through and discussed/analyzed in a newbie-friendly fashion (I wouldn’t have attempted these posts if I didn’t think that were true), but because so much of the story and themes hinge on setting up a world and all its little prejudices and assumptions and then systematically picking them apart, it’s also a series that takes on whole new dimensions the second time around. This is especially true where Anthy is concerned, which is why I’ve been skirting the topic pretty much since these posts began. 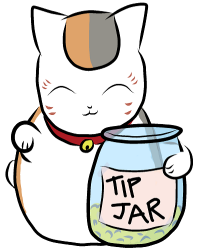 But now we can finally talk about her! Huzzah! for this week, as we touched on the “eternity” of memories as well as how the narrator’s perspective can alter a story. Memory and perception are back again this week, and storytelling literally takes center stage. Which, in an episode this dense, seems as good a place to start as any. Right off the bat, we know things are going to be different this week, because our moralizing shadow girls have stepped out from behind their curtain to reveal that they’re not separate from the story at all, but just other students at this school, as entrenched in this world and all its misconceptions as anyone else. Still, we’ve been trained to read their scenes as a kind of abstract “truth,” so we go into their play expecting answers from it. And we do get answers, of a sort. “The Tale of the Rose” is the truth as understood by this society and especially this school. It’s a fairy tale, yes, but fairy tales are meant to convey morals, ideals, “proper” ways of behaving or seeing the world. Cultural truths, basically. There’s a reason so many of our oldest tales don’t use actual character names but rather titles or characteristics. In the same way, shadow plays are faceless; they’re meant to convey not individuals, but archetypes and ideas. The other major archetype is that of the prince, who over time has come to embody… well, everything, just about. The witch tells him he is the “light of the world,” and that the light of the world is eternal, shining, miraculous, and can revolutionize the world—everything out duelists have been fighting for. The prince comes to stand not just for a single hope or ideal, but for any (or all?) of them, depending on the perspective, making him even less of an individual than the princesses and witches of the world. There’s a philosophically tangled question here about meaning and symbolism which I’m gonna struggle to properly convey, but here goes nothing: Archetypes and symbols stand for distilled or simplified versions of cultural expectations, objects, virtues, what have you. We’ve talked before about metaphors and how they have flexibility to them so that, say, Nanami’s egg can mean different things depending on the context. But suppose you have a symbol that’s so vague it can mean anything to anybody, and people just use it to represent whatever they want? In that case, the thing itself—the prince, here—would have no form or meaning of its own; it would be wholly dependent on the observer. In other words, it’s inherently meaningless. This is the concept at the heart of absurdism—that life/existence has no inherent meaning, just the meaning we as individuals find in it—as well as at the center of our arena’s Castle in the Sky. There’s no prince inside except the ones our duelists envision, an ideal outside of themselves that they hope to reach. Which begs a second question: Are people themselves nothing more than the value/meaning others place upon them? Have time and cultural understanding morphed Anthy into the witch, the Rose Bride, the “key” to the castle? All of our duelists (even Utena) have at one point fallen into the trap of using Anthy as a stand-in (or scapegoat) for their own desires, same as they have the castle. Is she no different than the shadow figures, the archetypes in the play? both in terms of the shadow figures that turn individuals into abstract ideals (as discussed above) as well as the large swathes of black space used to frame characters and convey a narrowness of perspective. “The Tale of the Rose” is more than just a nifty fairy tale about gender expectations and abstract cultural values: It’s also what remains of a true story and real, unique individuals, passed down through generations by the families of the princesses and chock-full of their own prejudices, narrow perspectives, and beliefs. As such, it’s not only limited, but flat-out wrong. In flashback, we see Dios himself worn ragged from the villagers’ demands, trying to save everyone and slowly losing himself in the process. As Vrai notes, his costume takes on the same muted colors of the villagers, as if they’re already stripping him of his personhood, painting him in broad archetypal strokes. Only Anthy stands out, splashed in reds and purples, an individual with agency who chooses to exercise what power she has to save the brother she loves. In return, she’s pierced with the swords of hatred and left in a state of half-death—and, you’ll note, framed in profile, robbed of a distinct form and face unless you’re willing to cross the rift and draw close enough, as Utena does. 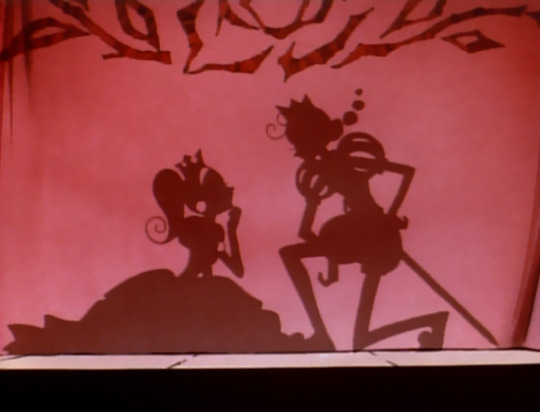 Basic world-building aside (for example, Anthy’s seeming ability to teleport is likely due to the fact that her body is a projection, since her real form is currently trapped in the hell Utena visited), this episode recasts Anthy as a perpetual pariah, the “witch” forced to bear the blame of all the world’s ills—a world forever seeking salvation (and denying responsibility) from figures outside of itself, never acknowledging those figures’ own suffering, never thinking they could perhaps “save” themselves instead of relying on others. 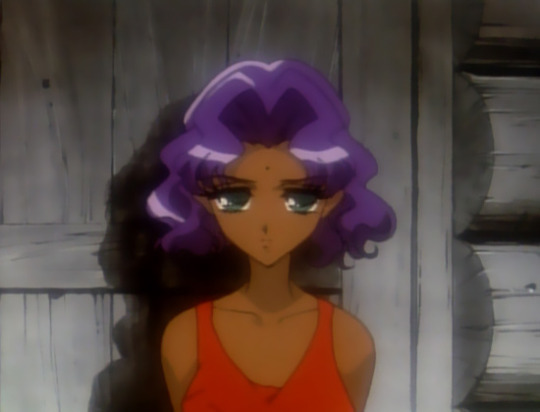 We see the students at Ohtori Academy doing essentially the same thing, using Anthy either as a scapegoat or a stand-in, never treating her as a person herself. After all that, is it any wonder that she remains loyal to what remains of her brother, despite how toxic their relationship has become? Given what we know about the people who relied on the prince, it’s not surprising that Dios and Anthy’s tale should have been so thoroughly warped over the years, becoming “The Tale of the Rose” the students know today. What’s more surprising, though, is how much Utena’s own memories have shifted over the years, so that she’s not only forgotten the reason she wanted to become a prince in the first place, but has even changed her goal entirely. She no longer wants to be a prince to save somebody, but rather as a way to meet her prince again—and, by implication, to be saved by him once more. In a roundabout way, she’s imitating a prince so she can one day become his princess. 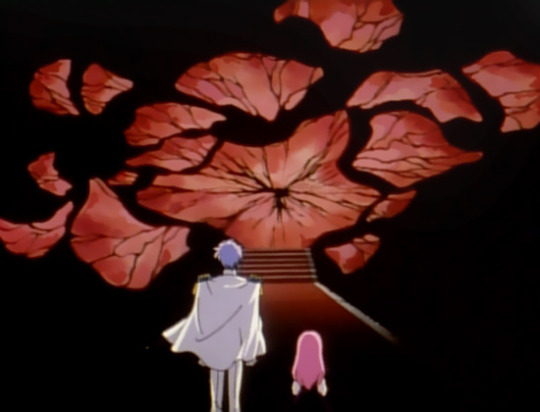 It circles us back to Mikage’s own faulty memories, and reminds us of the parallels between him and Utena, as well as the fate they could share if Utena isn’t careful. Both were inspired to achieve something “impossible” (becoming a prince and achieving eternity) in order to save someone; both were slowly subsumed and used by a system (and an older sibling) they didn’t fully understand; and both have memories they treasure but cannot trust. 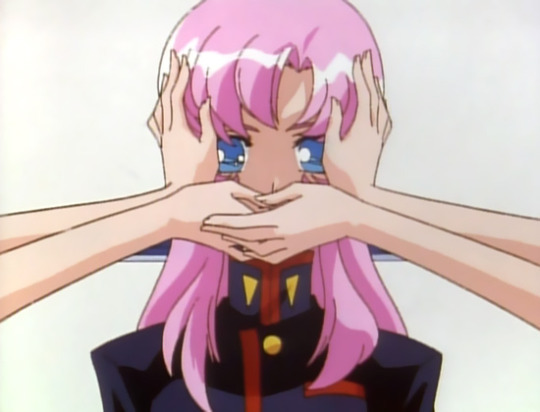 Nobody sat Utena down and forcibly told her to change her story. There was no clear-cut moment, as there is with the play, where we can say THIS is the incorrect thing, this is how and why you changed it. But there are a thousand little things: Akio telling Utena she’s bound to forget this moment and that she will become a woman (one who cannot save), dismissing the validity of her choices and her story from the word go; the narration itself almost laughing at her princely decisions, the condemnation from her teachers that she’s not acting like a “real” girl. Utena starts out very much hedging her bets, in pursuit of that “totally normal boy” and can only remember a prince who changed her life. Years of little pressures wear a person down, wear a story down, and unless one is constantly fighting to hold onto that story it will eventually be subsumed into what the powers-that-be find palatable. Utena’s going up against not just her own faulty memories, but a culture which constantly pressures her to change those memories and herself. She’s already succumbed to and been shaped by those forces. If it continues, she could easily be caught in a trap similar to Mikage’s: trapped by a past that never existed, used by Akio to forward a larger agenda, and eventually tossed aside when she’s worn out her uses. 34). Then, during the photo shoot, she makes it a point to stand between him and Akio. And then, when Anthy does leave the two alone, it’s Utena who rejects his advances, telling him she wants to remain “true” to her prince—or rather (and importantly), to the promise she made to him. Utena may not remember the specifics of that promise, but she remembers that she must keep her nobility at all costs. It’s also noteworthy that this all happens immediately after Akio laments how “hard” it must be to be Anthy’s friend, implicitly opening the door for Utena to agree with him and vilify Anthy. 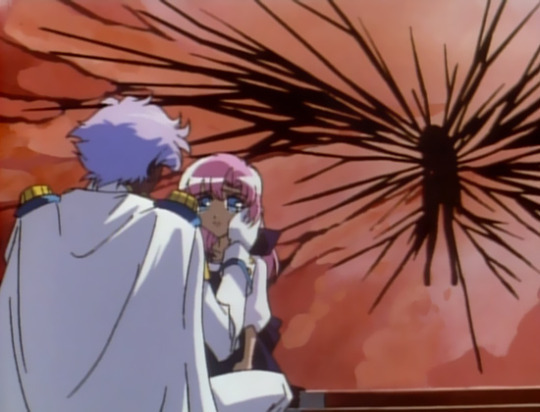 That Utena rejects his assumptions about Anthy and then rejects him suggests a connection, even if it is a tenuous one. Anthy’s position and role make it easy for others to blame her, but Utena never does. It speaks highly of their bond, and may even suggest that Utena hasn’t entirely forgotten her “something eternal” after all.